With a focus on policy change and challenges for Arts, Social Sciences and Humanities. Programme runs from lunchtime to lunchtime (12-13th May), and includes Conference Dinner with guest speaker Rick Rylance on 12th May. Professor Alison Halstead is the Pro Vice Chancellor for Strategic Academic Developments at Aston University. Prior to this she was the Pro Vice Chancellor for Learning and Teaching Innovation at Aston University, and has held positions at the University of Wolverhampton, Coventry University, the Open University and Brunel University. At Aston University she led the creation of the Centre for Learning, Innovation and Professional Practice and the Aston University Engineering Academy. 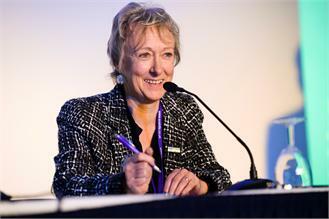 She will be speaking at the ‘Personal Journeys’ panel at DASSH-UK’s Spring Conference 16-17 May 2013. • What prompted your move from research to HE management? The move happened when I was at Coventry University. At the time I was the Head of Physics and Materials and we’d just returned a very successful RAE. However, it was unfortunately a difficult time for recruitment into Physics and several universities were closing their Physics departments. Senior management were looking strategically to where they needed to rationalise, and Coventry University fell into that category. They closed Physics and Materials, of which I was the Head. I had already taken over Chemistry and the Environment as well, so I became the Head of Environmental and Physical Sciences but I was no longer a subject-area person. In terms of the move from research to management, it was more of a push than a jump! I’d always been passionate about learning and teaching, but the move did then lead to the role as Director of the Centre for Learning and Teaching, after which I spent five years as Dean of Learning and Teaching in the University of Wolverhampton, and then five years as Pro Vice Chancellor for Learning and Teaching Innovation at Aston. • What attracted you to the role in Aston University? I think at the time it was very similar to the cross-university role I held at Wolverhampton. It was a PVC role so it involved more responsibility and greater opportunities to develop and implement one’s own strategy and really push things forward. • How would you describe your personal journey to date? I think I’ve been incredibly fortunate to work in academia, which mostly allows you to do anything your judgement informs you is the right thing to do without anybody stopping you. I think a thirst for knowledge, being well-informed by research and best practices, and an ability to bring large projects to successful completion have enabled me to have an enjoyable journey. I’ve always had a fantastic time, and when I haven’t I’ve started looking for something else. • As Pro-Vice-Chancellor for Learning and Teaching Innovation at Aston you have been at the helm of many projects, including the establishment of the Centre for Learning, Innovation and Professional Practice and leadership of the development of the Aston University Engineering Academy. Have widening participation and pedagogical research been key drivers throughout your career? I think that every academic at every institution should be engaged in communicating their discipline or their passion. Academics should always be interested in best practices and the highlights of research in their field, and be willing to communicate that in the most appropriate circles whether that be through keynotes, academic journals, conferences, or other forums. If you’re a well-rounded academic, you should have the skills to communicate research broadly. I think that everyone should have incredibly well-honed research skills – that’s research skills across the entirety of qualitative and quantities methods. We should always research our practices, our strategies, our management, our communications, our discipline; our research should be across the range of disciplines rather than strictly within our specialised disciplines. I’d propose that very few HE institutions actually make full use of the capacity of expertise that we tend to have. • Aston University holds an Athena SWAN Bronze Award; at the DASSH-UK Spring Conference Professor Yvonne Galligan will discuss how AHSS can benefit from similar SWAN-based reflection. To what extent do you think gender has affected your career or affects researchers in general? I actually led the bronze submission for Athena SWAN for Aston! The great thing about going through the Athena SWAN process is the insight it gives you by looking at benchmarks and institutions’ raw data. With regard to gender equality, I think that Aston University is particularly unique in this instance. When Julia King was appointed Vice-Chancellor at Aston in 2006, only 1 of the top 14 positions in the University was held by a woman. This number has now increased to 8 of the top 14 positions, so she has had a significant impact on the representation of women in the University. This is particularly marked considering that the University is quite science and engineering-oriented. I wouldn’t have said that gender has been a factor in my career. It’s only now at the latter stages of my career that I do wonder if we should be more proactive. At the early stages of my career I thought we’d get the balance through fairness. However – and this is the benefit of the Athena SWAN process – when you look at the hard evidence, and really reflect on it, it gives management and leaders an insight into gender representation. • Lastly, what’s on your plate at the moment? I’m the lead for the creation of a new Vietnam- UK state research-led University, which the Vietnamese and the UK government agreed to set-up together. Aston University is the UK lead institution and I am leading the project team I’m just back from eight weeks in Vietnam where we were in discussions with the government regarding budgets, degree programs, and best practices, so we’re right at the start of the project. The new VN-UK university will grow as a small business within the University of Danang, and will be officially launched in October to coincide with 40 years of diplomatic relations between Vietnam and the UK. Professor Halstead will be speaking at DASSH UK’s conference on 16-17 May 2013. Booking details for the conference can be found here. Alison gained a Physics degree and Materials Engineering PhD at Imperial College. Her early career was with Tube Investments before returning to Higher Education. She has held academic posts at Brunel University, Coventry University, the Open University and the University of Wolverhampton, before joining Aston University as the Pro-Vice-Chancellor for Learning and Teaching Innovation in 2007. At Aston she created a new Centre for Learning, Innovation and Professional Practice bringing together widening participation, learning technologies, peer mentoring and pedagogical research and in her role as Head of Quality and Standards, oversaw the successful institutional quality audit. Alison led the development of the Aston University Engineering Academy for 14–19 year olds from the outset and for the last year of the School’s development relinquished her learning and teaching portfolio to support the national creation of University Technical Colleges as the Director for University Partnerships, at the Baker Dearing Trust. In 2011 she chaired a Skills Commission Inquiry into Higher Level Technical Skills and City and Guilds recently awarded her an Honorary Fellowship for her national work on Apprenticeships, University Technical Colleges and High Level Technical Skills. In September 2012 Alison returned full-time to the University as the Pro-Vice-Chancellor for Strategic Academic Developments, currently working on the creation of the Aston-led Vietnam UK University in Danang. She is a Board Member of EU Skills, The Children’s University and the University Vocational Awards Council. We are sorry to announce that due to the low numbers of members registering for the May conference, we have had to make the difficult decision to cancel it. We would like to thank everyone again for the various ways through which they agreed to support the event, and we hope that it can be arranged for a future occasion. We are communicating with all participants to arrange any recompense. DASSH-UK Executive seeks nominations for Ordinary members. Nominations, accompanied by the names of a proposer and a seconder, should be sent to the Hon. Secretary (Kris Spelman Miller) in advance of the AGM, which will be held on 15th May at the end of the May conference. The outcome of the elections will be announced at the AGM. Ordinary Members are normally elected for four years in the first instance, and may be re-elected in their post for a further two year term. The DASSH-UK Annual Conference will take place 15-16th May at Regent’s University London. The conference dinner will take place on Thursday 15th May. For the full program and ticket bookings please visit the booking site for booking information. If you have any questions please contact Sarah Rimmo-Toure by email: rimmotos@lsbu.ac.uk or phone 0207 815 5743.